In traditional karate bouts a point system is used to determine the winner. There are numerous ways for scoring point-matches in karate. 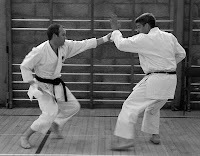 A point (ippon) is called when the referee sees what s/he feels is a scored technique, i.e., one that makes solid contact delivered with good form and balance within the boundaries of the fighting perimeter (ring). Once the point is called the action is stopped (yame! ), to which the ref quickly confers with the seated ring judges for full approval. Sometimes half-points are awarded, or none at all because the technique lacks conviction. The action is then resumed. Point values can vary, depending on the technique, e.g., kicks to the head outscore punches to the body. Compared to MMA, Muay Thai and K-1 bouts, traditional karate matches seem rather tame. Because of the way points are awarded the dispositions of the fighters are to 'stay back', sometimes producing an unrealistic sense of ma'ai (range). As such, infighting and clinches are rarely seen in karate matches. Still, I've seen some serious damage done at these "traditional" events. Knockouts, knocked out teeth and broken bones do happen. I can still remember having to sign waivers that excluded the promoters and owners of the venue from any kind of liability that could result from mishaps, including death. Players are exhorted to punch or kick full-bore to the body, however, head shots must be delivered with "control" or a disqualification is in order. A disqualification can also be rendered if it's determined that a competitor is being unsportsmanlike in some way. Deliberately trying to hurt your opponent - or in the words of Mike Tyson, fighting with "bad intentions" - will get you thrown out of the ring. The point system probably comes from the old idea that karate strikes are lethal. The whole notion of karate's one-strike-one-kill was the basis of one local promoter's idea to have a one-point match tournament! Could you picture people plunking down a $40 entry fee only to be counted out with a single shot? Imagine the arguments with (and among) judges that would ensue. Fortunately this idea never took flight, at least in my neck of the woods. Most spectators would probably agree that a continuous sparring match would be more entertaining to watch, which was obviously what gave rise to full-contact karate or American-style kickboxing back in the early 70s. Many point-match karate competitors eventually went the route of kickboxing, such as Bill Wallace and Joe Lewis. In kickboxing (like regular boxing) the goal is to knockout your opponent, not win by points, even though that's what happens by default if the bout goes the distance. Point fighting may seem like a glorified form of tag for some, but for most karate practitioners it's the best system there is to safely test one's abilities for sport. Even if you're not really into the sports side of karate and don't do competition point sparring is amazingly good exercise, building stamina and speed. It also teaches you to cope with the unpredictable, builds mental focus and concentration, and helps you learn to control distance - all of which could be useful one day in a street fight. ...teaches you to cope with the unpredictable. That's sparring's best feature. It's also a good way to see how people handle themselves under a little pressure, especially if you compete. ...all of which could be useful one day in a street fight. Hopefully. Depends on the person and how they train. A hotly debated topic that's been around a long time. In my post I mention that point-fighters keep their distance (as opposed to controlling distance) -- something that basically never happens in a real brawl. Bunkai and other methods of close-quarter self defense go a long way for the real thing. The thing is, it's difficult to train for bunkai in a free-style manner. Ultimately it's useful to have both: the spontaneity of kumite and the applications of kata, which are the real nuts and bolts of karate. If you have time Sue, check out this article that addresses kata and kumite. I think, as Cyan said, that even in point sparring there is the need to differentiate on contact level. In some tournaments scoring means touching and in other tournaments a point could be a strike that produces real visible effect. Here is a link with some examples of kumite with different mentality and goals.